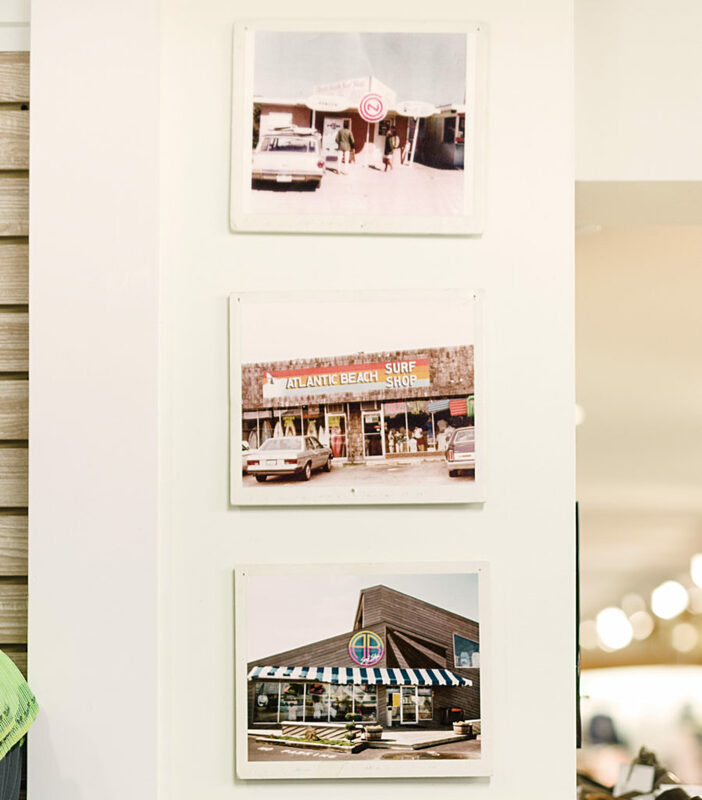 In the 1980s, three Atlantic Beach surf shops — Bert’s, AB, and Marsh’s — gave teenagers a social network as connected as Facebook and as immediate as Twitter. Before long, surfer fads turned into fashion, gossip became news, and young people found their community. Whatever happened had taken place close to sundown, Gabe apparently wanting to get in one last wave before heading back to college. Late in the day was sharky, for sure, a fact that gave credence to the gossip blooming the next morning in homeroom. Poor Gabe. Tan, towheaded, and a year older than me, he was just home for a weekend visit. Reports turned progressively bleak as the day wore on. It was all we could do to wait for the last bell, but when it rang, my friends and I knew where to go for the real story. 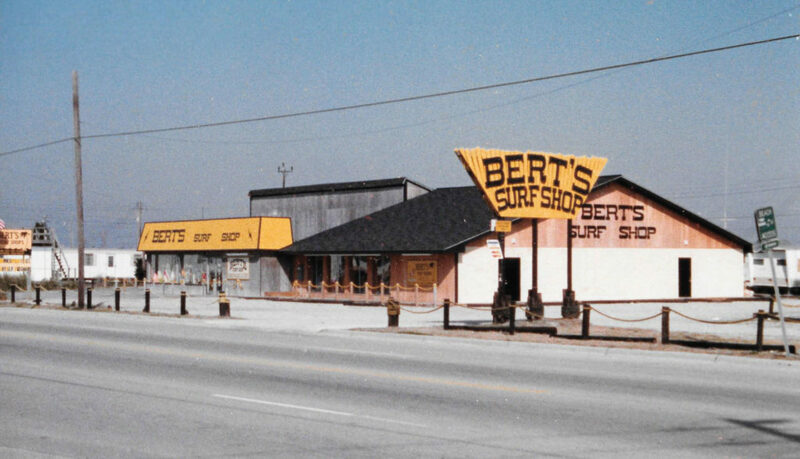 We headed to Bert’s Surf Shop, where a junior we knew worked the counter. We clustered in the parking lot, waiting for him to show up, anxiously crunching gravel beneath our Rainbow Sandals, the upscale flip-flops we all wore year-round. (Most kids in Atlantic Beach only owned closed-toe shoes for funerals.) When the guy arrived, we swarmed. I believed her, of course. How could I not? She was wearing the newest color of Birdwell Beach Britches, the ones Atlantic Beach girls like Sarah could get away with wearing, even though they were boys’ surf trunks. Nylon with a lace-up front and Velcro fly, they were actually too constricting to be good surf wear. But worn by a girl, they conveyed a certain status: cool. They had a special pocket, with an eyelet drain, specifically for surf wax. No one ever used it for that, but the symbolism was important. My circle got their Birdwells from Bert’s, due, in no small part, to Sarah, who was a walking billboard for the latest colors. (Today, we might call her an influencer.) I wasn’t a Bert’s girl at heart. Marsh’s, owned by the eponymous local surf family, was more my style. Most of my good friends claimed Atlantic Beach Surf Shop — known as AB — as their favorite. Together, these three emporiums of beachwear composed the holy trinity of surf culture. But even if you weren’t a surfer — and I never was — the social scene that sprang up inside and outside of these shops was your Facebook, your Twitter, and your Instagram combined. Your shop preference was a shortcut to understanding your personality: extrovert, introvert, or the chill ideal in between. AB was only two blocks from Bert’s. We figured Bailey, one of the best surfers at our school, would be there with news. While Bert’s was full of every kind of beachy thing you might need or want, I wasn’t convinced that the kids behind the counter would know the details of a real-deal shark attack. AB was Gabe’s hometown haunt anyway, and the oldest surf shop in the state. It smelled like leather and shellac to Bert’s rubber and tanning oil. Ray-Bans, if you had that kind of cash, came from AB — for Oakleys, you went to Bert’s. Our coveted Rainbows came from AB. Even though Marsh’s and Bert’s carried them, too, AB was first, and to us, first usually meant best. Right away, we spotted Bailey’s car in the parking lot: Unlike the other surfers, who had racks on their cars, Bailey had removed the passenger seat from his Gremlin and stuck his longboard out the window. He was sitting on the steps with a girl named Carly. She was still thought of as “the new girl,” but she’d been in Atlantic Beach long enough that we didn’t call her a dingbatter — beach slang for tourists and new people — anymore. I had been a dingbatter in my childhood, spending half the year in Atlantic Beach, the other half inland, but I lost my dingbatter status when my family moved to the beach full-time. Now, the coded language of surf culture was my own. I asked Bailey if he’d heard about Gabe. “But don’t most shark attacks happen in shallow water?” Carly asked. About this time, one of the managers of AB came out to smoke. He knew full well what we were talking about, and told us that Gabe probably just scraped his leg against a sand shark. Skin like sandpaper, happens all the time, he said. But we had his number: Although AB catered to a serious surfer crowd, their customers also included many a dingbatter with spending money. And dingbatters didn’t love shark talk. The first thing you saw as you drove over the drawbridge into Atlantic Beach was a huge mural painted on the side of a building facing the water: a surfer against a sea of deep green and white foam. 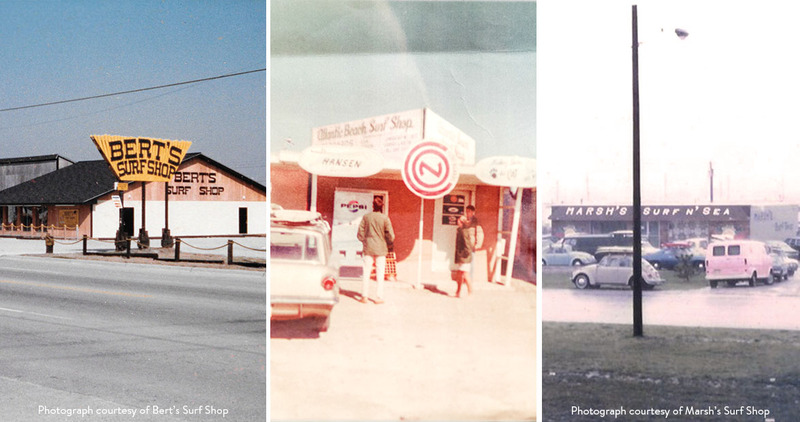 Marsh’s Surf Shop was started by Bette Marsh, a legend in the Carolina surf world, and her sons. Bette pioneered the Eastern Surfing Association, and her son Mickey Marsh and, in turn, his son MJ made their marks as professionals who competed all over the world. Aside from stocking a decent chunk of the clothes worn at our high school, Marsh’s sponsored the daily surf report on the radio. You had a pretty good chance of having a conversation with a pro surfer at Marsh’s — if you knew to go around back, and your timing was right. We found Brian around back, waxing a board. A tall 18-year-old with lean muscles and wavy copper hair, he was the only person any of us knew outside the military who had a tattoo: the Rip Curl logo, the brand of wet suit he favored. All the shops sold them, but Brian made a point of buying all his gear from Marsh’s. He smiled and tossed the wax to me; blessedly, the universe allowed me to catch it. “All right, bookworm,” he said to me, “you’ve got the conch, catch me up.” This was an inside joke between us. I had helped him with his Lord of the Flies paper the year before, and I knew he meant bookworm in a nice way, even if Carly heard it as an insult. I didn’t like where this was going: A nurse shark is basically the teddy bear of the shark world. Kids sometimes picked up small ones to play with in tidal pools. I once had a meltdown at Cape Lookout because I thought I was being attacked by a jellyfish (it was a bread bag), and even I would not be afraid of a nurse shark. If a nurse shark bit Gabe, it would be a first. And kind of an insult, actually. I’m sure my mouth fell open: So it was true? “So it was a shark bite?” Carly asked. I live in Morehead City now, across the high-rise bridge that replaced the slow, lumbering drawbridge that I used as my excuse for being late everywhere when I was a teenager. Marsh’s sits at the foot of the bridge, where the causeway starts, and still has its signature smell of cork and wax, the library quiet and soft lighting. The display of ukuleles is new, but the rest looks like old times. The shirts and shorts are carefully hung at perfect intervals, as though measured by a ruler. Wet suits hang on the wall like space suits, emitting their rubbery scent. If there can be a surf-shop feng shui, Marsh’s has mastered it. The young man behind the counter, Calvin, shows me the boards. There’s nothing so blindingly shiny and clean-looking as a new board. Just running your hand along the gleaming surface makes you want to learn to surf. 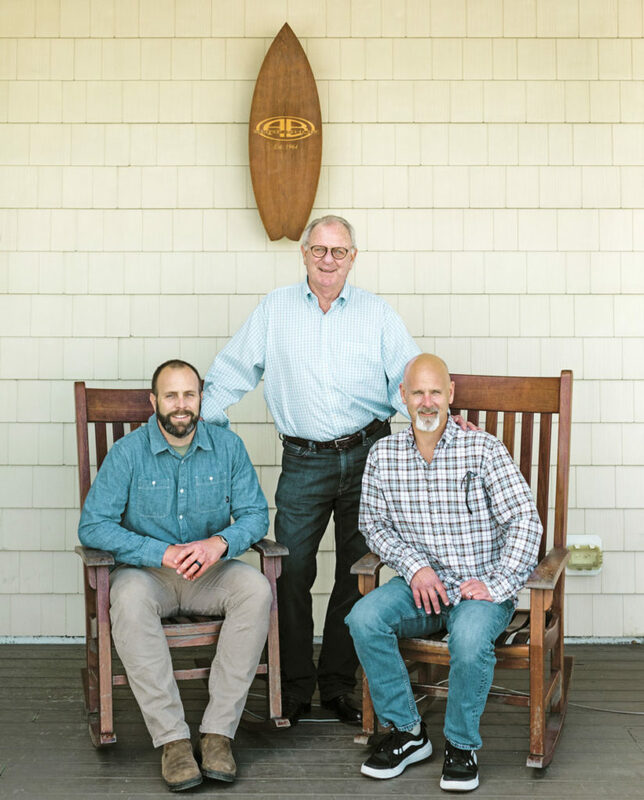 Racked on the ceiling are dozens of the Marsh family’s personal boards — boards that traveled the world with their owners, only to come back home. Together, we quietly skim the framed newspaper clippings on the walls. The articles from my era have yellowed with age. There’s a picture of the old beachfront parking lot I remember well, with the overhead sign, “Marsh’s Surf and Sea.” Customer parking doubled as an entrance to the breakers — the big, open seaside lot was like gold. It’s what Mickey misses most from the old days, before the shop moved. “It’s always changing,” he says, meaning all of it — the shop, the sport. Life. Not that he’s wishing for anything different. “What do you remember about the ’80s?” I ask. “The kids?” I want to believe he remembers us. True. The AB stickers on every notebook spoke to that. I even used to have one on my salt-sprayed Chevette window, so I buy a new one for my Mazda on the way out. If only I still had my Wayfarers (bought at AB), I could hang them from the rearview mirror by my turquoise Croakies (bought at Bert’s, of course). Bert’s: It’s pretty much the same — there’s just more of it. It looks like the old Bert’s exploded inside itself, and then an additional truck of merchandise was brought in and that, too, exploded. Phil, a manager who’s been at Bert’s since 1986 — two years after I graduated — leans on a counter in the surf section to talk about old times. It’s like we’re in a cocoon of gear. “I got my Croakies here,” I tell him. I point out something I remember not even from my high school years, but way back from my childhood: a promotional teddy bear wearing a tiny blue Rip Curl wet suit. “I can’t believe he’s still there,” I say. Linda Dunn is a writer in Morehead City. She's working on a novel.